The Toyota Mirai will soon have an SUV competitor. First and foremost, hydrogen fuel cell vehicles are not cheap, as the nearly $60,000 Toyota Mirai well proves. But isn’t it about time it receives some additional competition? Hyundai thinks so. The SUV will soon go on sale at select Southern California dealerships with a starting price tag of $59,345, according to . That price includes the $1,045 destination fee. The NEXO Limited trim increases the price to $62,845. It should be pointed out that aside from the two trims, there are no additional options and the NEXO is eligible for various incentives, specifically the $5,000 California Clean Vehicle Rebate. Fortunately, all NEXO SUVs will be nicely equipped with an array of features. The base trim features LED headlights, 17-inch alloy wheels, synthetic leather and heated power seats. Safety tech includes automatic emergency braking, blind spot warning, and adaptive cruise control. The $3,500 extra buyers will invest in the Limited trim tacks on larger 19-inch wheels, hands-free power liftgate, surround-view monitor, power sunroof, remote parking assist, 8-speaker Krell audio system, heated steering wheel and ventilated front seats. Aside from the Mirai and Honda Clarity fuel cell, the NEXO does not have a direct competitor, body style wise. With its estimated 380-mile range, the NEXO beats out the Mirai’s range of 312 miles and the Clarity’s 366 miles. Meanwhile, the all-electric Tesla Model X carries a starting price of $85,200 and a 237-mile range in base trim. However, the Model X 100D can only go up to 295 miles and costs over $100,000. 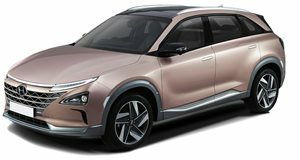 But because hydrogen re-fueling stations are not exactly in abundance, the Hyundai NEXO is not the most suitable choice for most buyers. And, of course, you gotta live in Southern California as well.